The countdown to March Madness is underway -- from Allen Fieldhouse to Cameron Indoor Stadium to Hinkle Fieldhouse. They're going crazy from Rupp Arena to Assembly Hall to Breslin Center. The crowds are shouting from the rafters at The Palestra, Madison Square Garden, The Pit and Gallagher-Iba Arena. Who's next at Pauley Pavilion, the Dean Dome or McCarthey Athletic Center? "A basketball team is like the five fingers on your hand. If you can get them all together, you have a fist. That's how I want you to play." Why watch? Duke -- needing to channel its inner Fists of Fury -- staggers into its top-10 showdown against Louisville with two consecutive losses, which means Coach K is stuck at 997 in his quest to join Harry Statham and Danny Miles as the only men's basketbal coaches to reach the 1,000-win plateau. Statistically speaking: Jahlil Okafor is averaging a team-high 19.5 points and 8.7 rebounds for the Blue Devils. Terry Rozier paces the Cardinals with 17.4 ppg while Montrezl Harrell averages 8.9 boards. Series history: Duke leads the all-time series 5-4 (1-1 in Louisville, 1-1 in Durham, 3-2 neutral). In the teams' most recent matchup, the Cardinals won 85-63 on March 31, 2013, in the NCAA Midwest Region championship at Indianapolis. Notebook: Louisville has a nation-best 111 wins during the past four years, and it's the only school with three consecutive 30-win seasons. 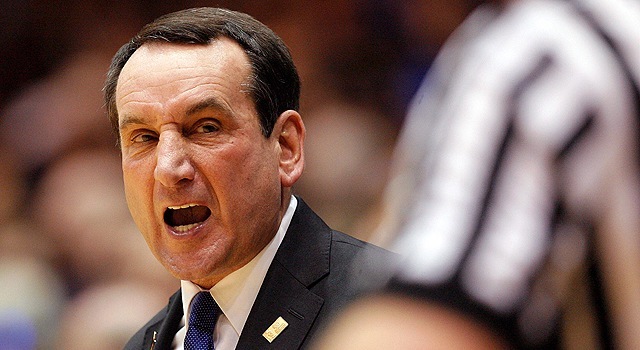 ... Duke has losing streaks of three games or more just four times during the past 20 seasons. The Blue Devils had two four-game skids during the 2006-07 season, as well as a four-game streak and a three-game slide in 1995-96. ... The Cardinals are getting warmer from the free-throw line, converting 76 percent from the stripe in the past nine games (66 percent on the season). Louisville is 19th nationally in free-throw attempts (414). ... Duke has allowed 10 3-point field goals in each of the past two games. The Blue Devils allowed just 4.1 3-pointers during the first 14 games. Information compiled from Duke and Louisville team sites.